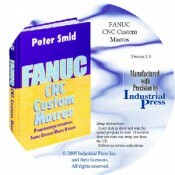 An invaluable companion to the author’s best selling CNC Programming Handbook, this book is a general introduction to the subject of macros (known as Custom Macros or User Macros). Its purpose is to make you aware of what macros are, how to develop them, and how to use them effectively. It also explores important related subjects and identifies several other helpful topics in this increasingly important and exciting field of CNC programming. • Offers many practical do’s and don’ts while covering all the popular Fanuc control systems exclusively. field of programming tools that macros are. • Numerous examples and sample programs are used throughout that serve as practical applications of the techniques presented and as the basis of ready-to-run macro programs. • Includes a CD containing all of the sample programs.